The Chix scored a team score of 198 at the final Jamboree of the season at Crestview Golf Course. The fourth place finish earned the team five points. The team total is now at 39 for the season. Going into the Conference Tournament on Saturday, the team is in 3rd place by just 3 points. Zeeland East shot a score of 206 on the front nine of Railside Golf Course. Leading the way was Elizabeth Klunder with a 45, Kristin Donnelly with a 51, Tess Mashour with a 53 and Sydney Ritsema with a 57. Tomorrow the Chix take on Jenison at the Meadows. 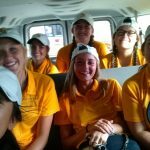 Girls Junior Varsity Golf, Girls Varsity Golf · Sep 13 Chix Varsity Golf takes 2nd place.